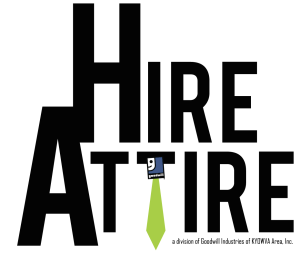 Hire Attire | Goodwill Industries of KYOWVA Area, Inc. Hire Attire, a division of Goodwill Industries of KYOWVA Area, Inc., works to empower men to overcome employment barriers, boost self-confidence and achieve independence for themselves and their families. Our program offers professional attire for job interviews or employment, career development tools, resume writing assistance, like skills training and job readiness techniques. More than that, men who are adequately prepared for an interview or a new career are more likely to stay employed and become role models for their families and communities. Hire Attire accepts clients from a variety of community agencies. An appointment time is established and we work one-on-one with clients to outfit them – literally and figuratively – with the tools they need to succeed. Won’t you help us make a positive impact on the lives of men in our community? We are always in need of donated professional attire. Call 304-617-6027 today or email us at hireattire@goodwillhunting.org and see how you can get involved! Hire Attire is located at the Goodwill Store and Career Center located at 1005 Virginia Avenue West in Huntington, WV. To become a community partner, click here. Community partners are available to make referrals to Hire Attire.